When you open the Scan my Bills - Documents box, there may be some documents sitting under Review Required or Review Pending. Scan my Bills hasn't been able to recognise all the information that is needed to create a transaction such as a supplier name or, the invoice lines don't equal to the total amount due on the invoice. Also if a document has been scanned from a photocopy, the quality of the document may not be good enough to use. You will be redirected to Xtracta in your browser to correct your document. The left-hand side of the screen is a copy of your document while the right side is the Xtracta mapping area. 1. 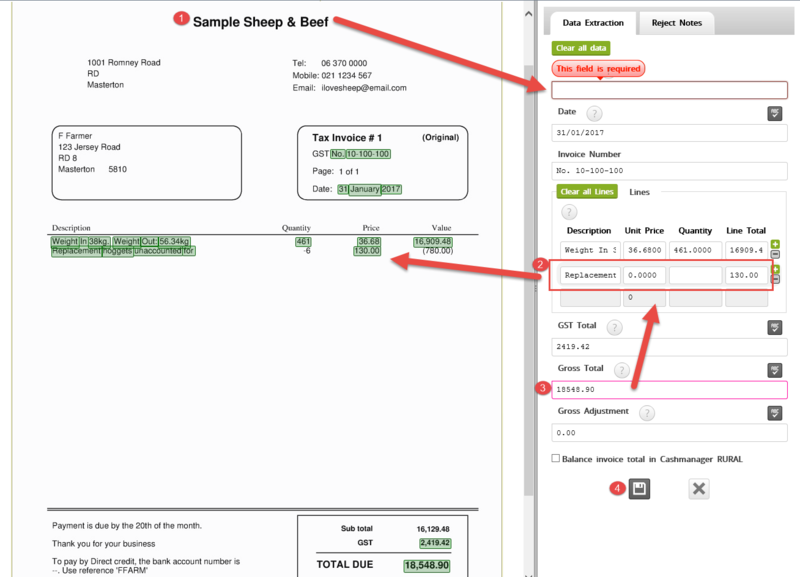 All fields need to be filled with information such as the supplier name, and any that aren't are highlighted in red. To map your invoice, highlight the information that is missing. This will automatically appear in the corresponding field on the right side. TIP: Hold down the left button on your mouse and drag the pointer over the area you want to highlight. 2. If you are mapping quantities, unit prices and line totals in a multi-line document, you need to map each line so that the document is balanced. 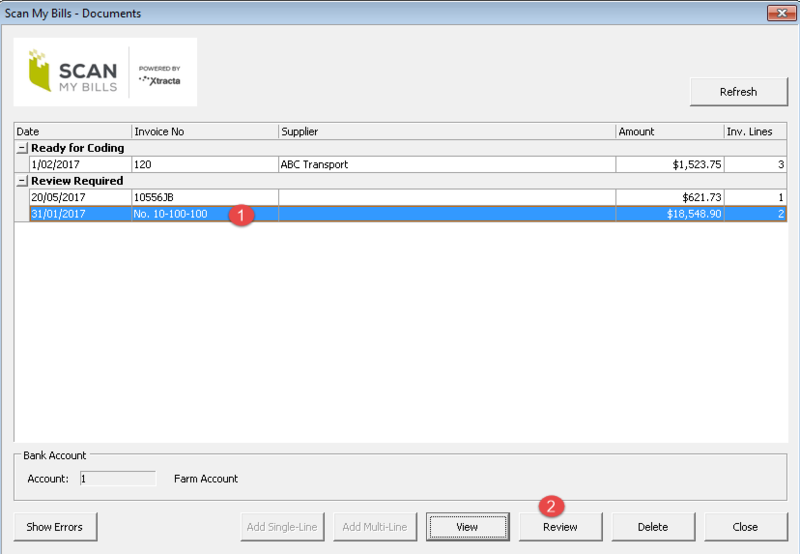 In the example below the quantity and line total for the replacement hogget credit on the invoice haven't been mapped in Xtracta. And this is causing the document to be unbalanced. 3. If the Line totals don't balance to the Gross total (the total amount due), you won't be able to import the document into the database Transaction screen. However, you will be able to save the document to come back to later. It will move from the Review Required area down to Review Pending. 4. If the document is balanced the Gross Total field will be green. Click on the save button, the document will be ready to move into the Ready for Coding area for you to bring into the Transaction screen. TIP: Once you're back in the Scan my Bills - Documents box, click on the Refresh button to move documents to Ready for Coding.